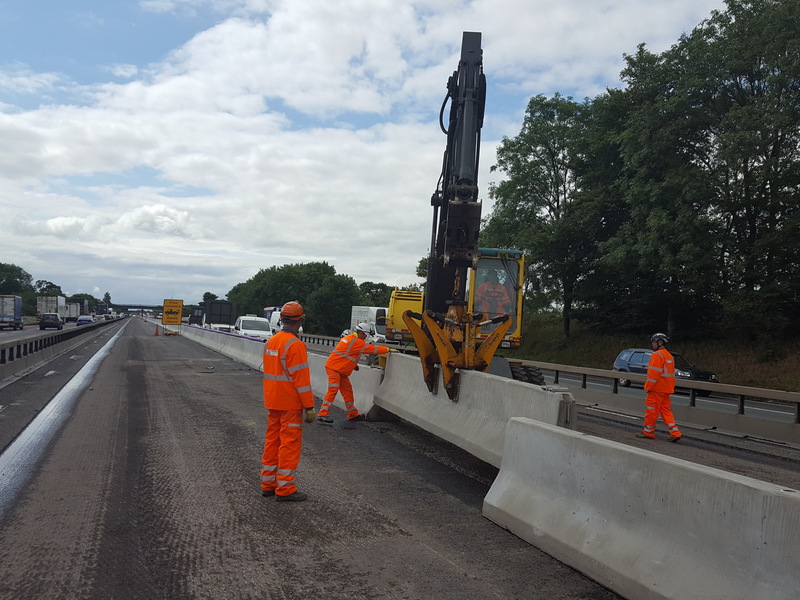 The Highways England scheme between junction 16 at Crewe and junction 19 at Knutsford has seen a new 20-mile-long concrete safety barrier installed in the central reservation. Placing a rigid concrete barrier in the central reserve, instead of steel, is designed to reduce the risk of vehicles crossing onto the opposite carriageway in collisions and is likely to require fewer repairs, cutting the need for lane closures. As part of the motorway upgrade, the hard shoulder is also being converted to a permanent extra lane, and new variable speed limits will help to tackle congestion and keep traffic flowing. Charcon Construction Solutions worked in partnership with Delta Bloc UK, which develops, manufactures, supplies and installs permanent and temporary concrete road safety barriers to the UK road market, in order to fulfil this prestigious scheme. Using the specially designed moulds from Delta Bloc, Charcon Construction Solutions manufactured around 5,000 barriers – each weighing four tonnes – to the exacting specifications. The products were manufactured off-site in factory controlled conditions, which meant Charcon Construction Solutions was able to guarantee the quality of the product first time. The barriers were delivered to the M6 project where Delta Bloc installed them using a rubber tyred excavator and mechanical scissor grab. As the barriers were precast, Delta Bloc were able to lay up to 600 metres of barrier per day. This is approximately five to six times faster than using more traditional slipform concrete construction methods, which involves extruding concrete on site to form the barrier. It also means that installation can continue during inclement weather which can prove difficult when using cast in situ concrete methods of construction. Tony Walker, MD of Delta Bloc UK, added: “Securing the order for the central reserve barrier was a key milestone for us because it demonstrates very clearly that the marketplace now sees precast concrete as a very credible alternative to more commonly used slipformed barrier systems.